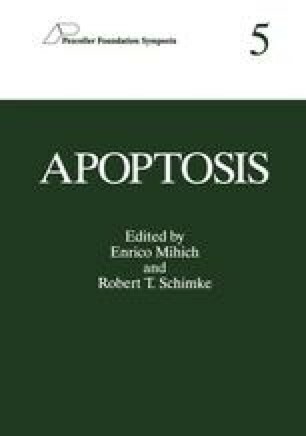 Apoptosis was originally defined by morphological criteria.1,2 One of the earliest morphological events in apoptotic cells is chromatin condensation to the nuclear membrane. This occurs well in advance of loss of membrane integrity. Concurrent with chromatin condensation, the nuclear DNA is usually digested into oligonucleosomal fragments by an endogenous endonuclease. This chromatin condensation together with DNA digestion has been called one of the cardinal elements of apoptosis.3 Furthermore, it has been shown that the chromatin condensation occurs as a consequence of DNA digestion.4 Because DNA digestion occurs while other organelles remain intact, it is presumed that the endonuclease is of non-lysosomal origin. It is commonly believed that the endonuclease is constitutively present in the nucleus, and that it needs activation by some signal transduction pathway originating from the initial stimulus or insult. Confusion in studies of apoptosis arises from a misperception that there should be a single signal transduction pathway to activate the endonuclease. However, apoptosis is a product of many stimuli which act through many pathways culminating in the activation of an endonuclease. Perhaps the only common event in all these pathways is the final activation of the endonuclease, if indeed there is even one single endonuclease responsible for apoptotic DNA digestion. Therefore, an understanding of the events that trigger activation of the endonuclease is essential for elucidating the pathways upstream of the eventual apoptosis. This paper will review the available literature and propose a model for activation of an endonuclease involved in apoptosis.